VOSTA LMG is a designer and manufacturer of ball joints with over 25 years experience. The standard range of Vosta ball joints is based on a patented bayonet type ball joint that was specifically designed for the demanding circumstances encountered in the dredging industry. 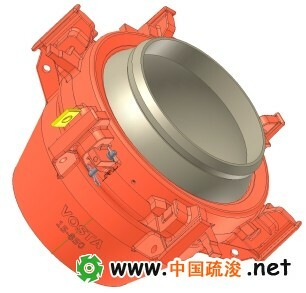 The design is well proven in the field and includes a replaceable wear liner in the case (female part) and a pipe through ball construction to protect the ball joint from direct wear. The bayonet connection is locked by either a locking pin or a locking plate. The main advantage of the locking plate is that it can always be easily placed and removed, because there is no need to line up any holes. Lining up the pipes during coupling is not necessary as coupling and locking takes place in any position within the maximum angle allowed by the ball movement. The range of standard VOSTA ball joints is available for various dredge pipe diameters. Besides the standard range VOSTA LMG also supplies a wide range of ball joints with alternative designs and features, for example increased pressure rating and alternative tilting angles. Information regarding these alternatives can be supplied upon request.